I had an opportunity to teach children programming in Scratch language for several months. I took a part in employee volunteering. My idea for the classes was simple. I wanted to show that computer engineering might be easy, interesting and enjoyable. We created simple computer games, animations. Children had fun and I was proud…This week I discussed my ideas for the next meetings after the holidays with other volunteers. I surprisingly discovered that our personal goals are different. I want to focus on advanced technologies this year e.g robotic – to inspire children – instead of build programming skills by creating more difficult games and animations. “Too slow, too boring for me and children” – I thought. I realized then that motivation have different meanings for us. I love risk and need challenges all the time. Others require peace and calm environment to reach their goals. Furthermore, sometimes it is a challenge to stay in a comfort zone! It depends on the workplace, neighbourhood etc. So… what do you think about the image? Is it always true? 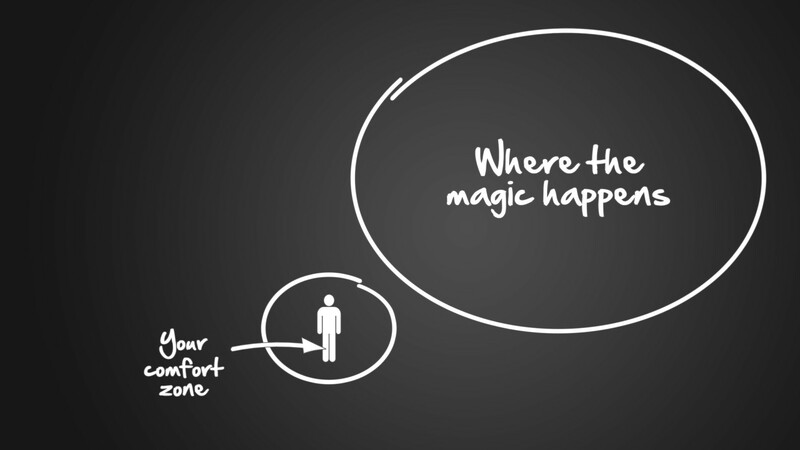 Now I think that for some people magic happens in their comfort zone. ← What is the difference between difficult and hard work?